We’re back from Japan! It was delightful! I’ve been chatting a bit about it on my instagram, so I’ll spare you here. That buzzfeed comic from a few weeks ago is giving me permission to write short posts and just leave you with the recipe! So here you go! 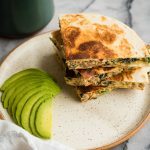 Breakfast quesadilla with white cheddar, sausage, and kale. Simple, easy, tasty. I guess I have a thing for tasty/easy breakfasts!! 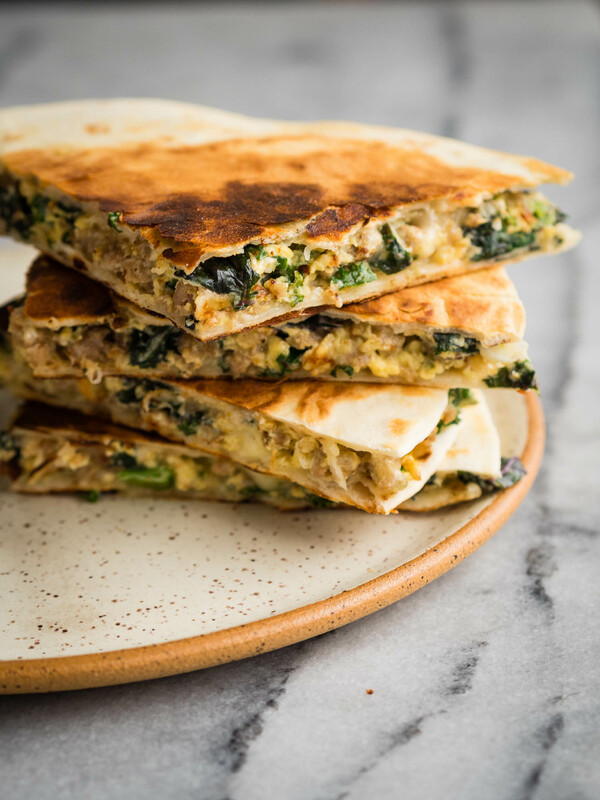 This simple breakfast quesadilla recipe has spicy sausage, white cheddar, and kale — all tied together with eggs for a quick, fun meal. In a small skillet, cook the ground sausage over medium-high heat. Let some pieces brown a bit, but stir frequently and break up big clumps. When the sausage is fully browned, and mostly cooked-through, turn the heat down to medium and add the kale. As the kale wilts, whisk together the eggs, half of the cheese, green onions, and a pinch of salt and pepper. Once the kale has softened, but isn’t totally limp, add the egg mixture. If your pan has dried out, you may need to add some oil/butter at this point to keep the eggs from sticking — if not, go ahead! Use long, slow pulls with a spatula across the pan to cook the eggs into a scramble. I like to cook this until it’s decently done — not the time for runny/wet eggs. Over medium-high heat, place a tortilla flat in the pan. 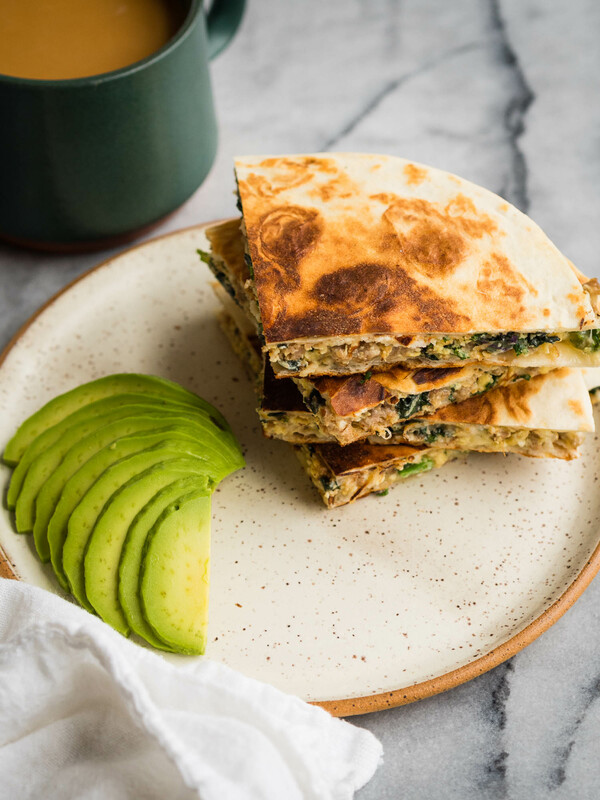 Sprinkle half of the remaining cheese on the tortilla, then carefully spoon the cooked eggs in an even, flat layer reaching nearly to the edge of the tortilla. Sprinkle the remaining cheese on top of the eggs, and cover with the other tortilla. Cook on each side until the tortilla is golden and crispy, and the cheese has melted. Flip carefully, using a hand on top to keep everything in place! Let cool 1 minute before slicing into pieces, and serve warm with (optional) avocado, sour cream, and salsa. Ah, such an interesting recipe, but I was wondering whether you can you make quesadilla a night before and then reheat? Or maybe 2 nights before, and eat one half 2 days in a row? I suppose you could … but I don’t think it would be quite as good! You could certainly prep all of the ingredients the night before, but I’d cook the eggs and assemble the quesadilla just before eating.